My freezer gets so messy! I love to stock up on frozen foods to make dinner time easier, but storing the frozen foods in a disorganized freezer can be a problem. I’m constantly moving things around, forgetting about the foods that get pushed to the back, or dealing with a frozen food avalanche when the structural integrity of my food stock fails. Time to organize my freezer! 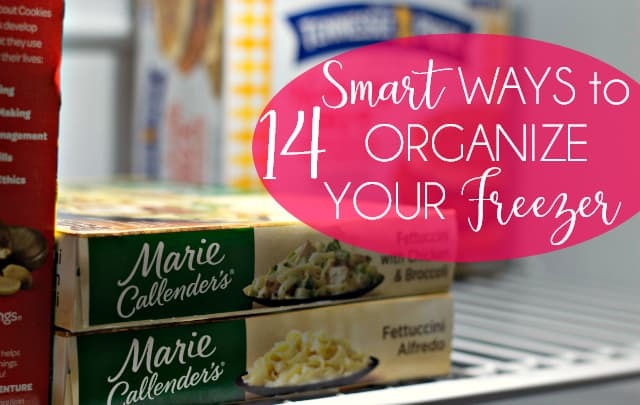 Below I’ll share with you my top 14 Smart Ways to Organize Your Freezer. After you conquer your freezer organizing challenge, you can stock up! 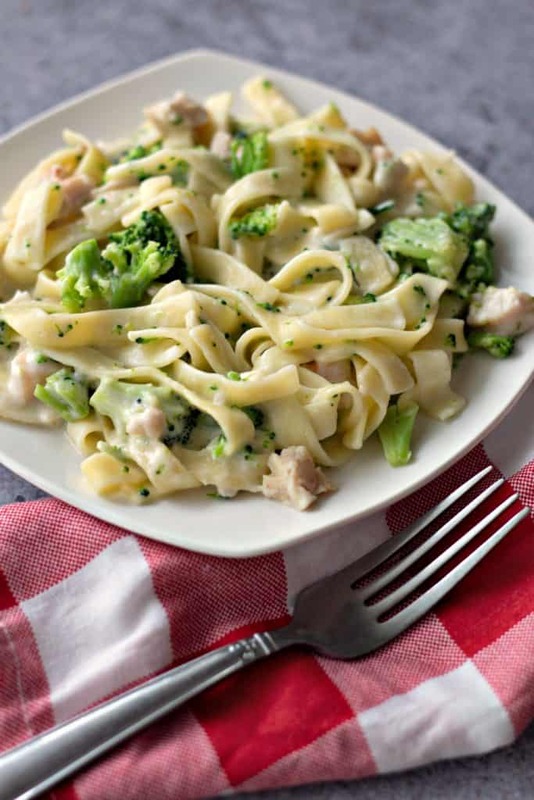 It’s a great idea to keep easy meal solutions on hand to feed your meal quickly and easily on those busy days. 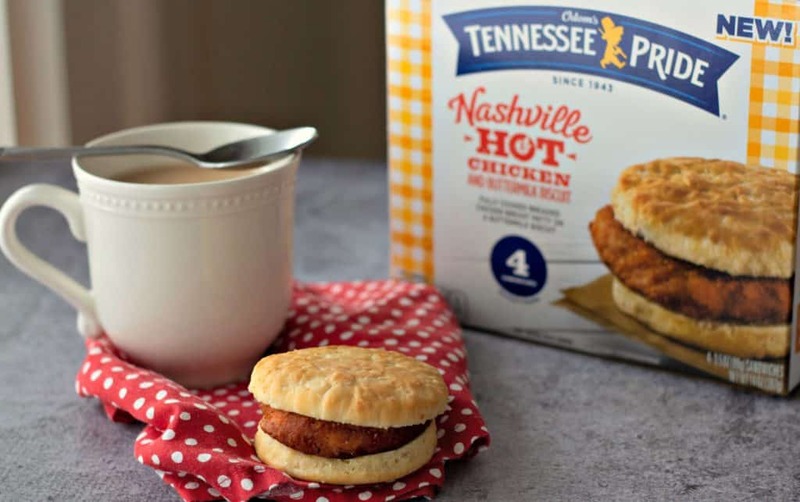 Ya’ll, these Odom’s Tennessee Pride Nashville Hot Chicken Biscuits are so good! 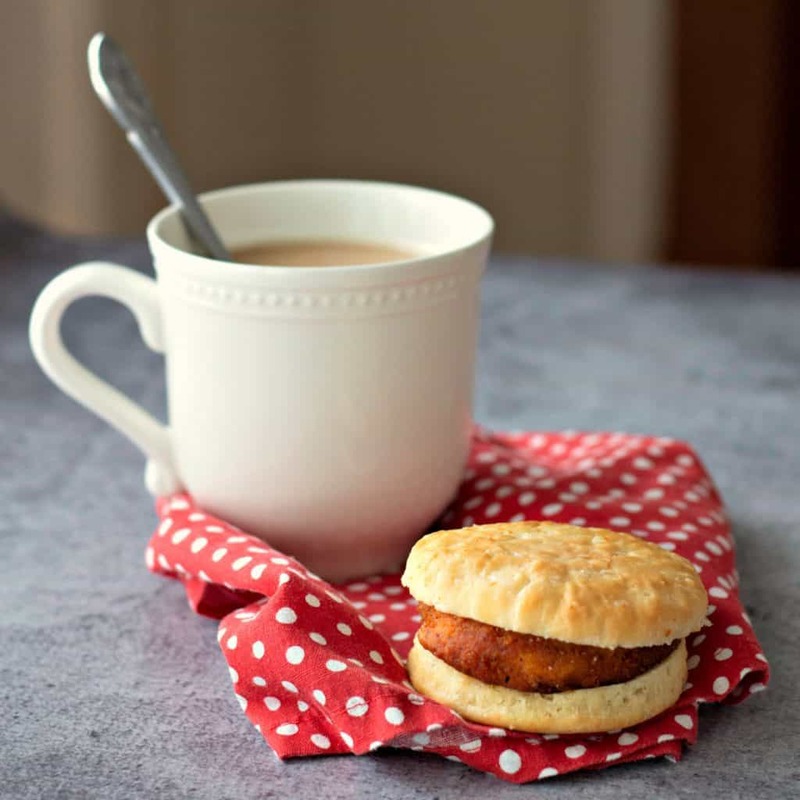 Love them for a quick grab and go breakfast. 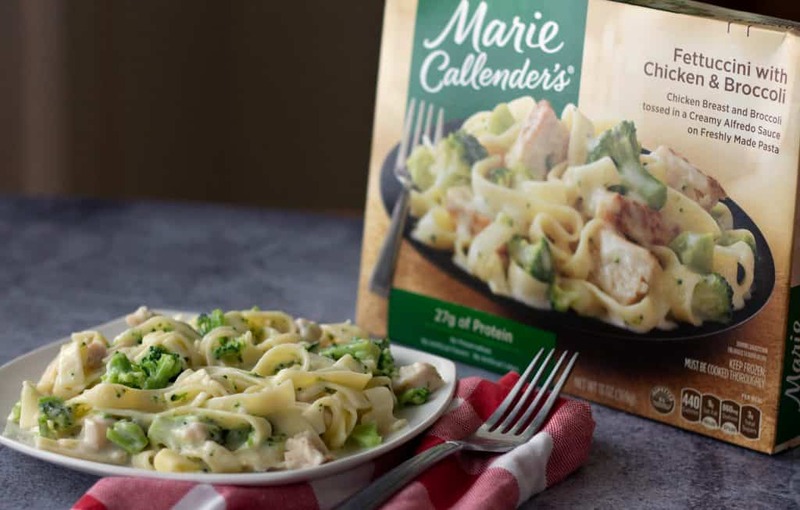 March is a great month to pick up your favorite brands like Banquet®, Marie Callender’s® and Healthy Choice® to fill your freezer. 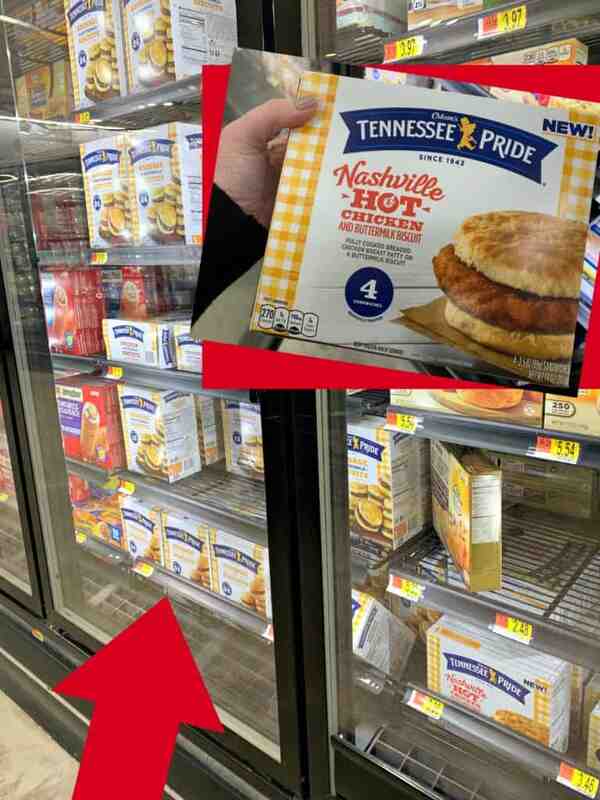 Everything you need for breakfast, lunch, and dinner prep you can find in the frozen aisle at Walmart! These are fantastic! Just a few minutes to heat, then plate and eat. 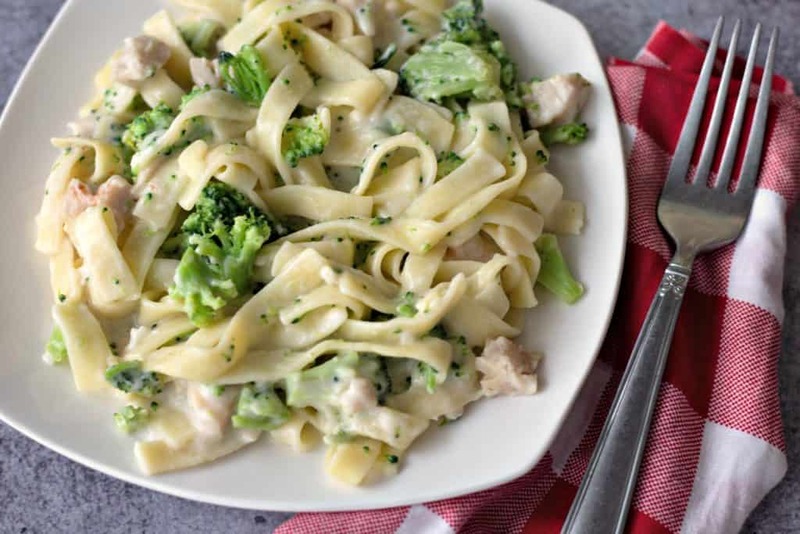 My seven year old daughter is a big fan of this quick dinner. All throughout the month of March, be sure to look for in-store demos featuring your favorite brands at select Walmart locations. They’ll even be passing out insulated frozen food bags! 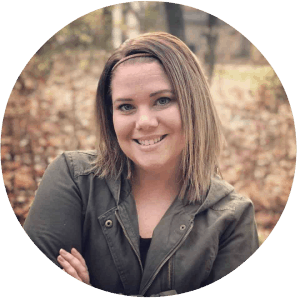 Before you begin your organizing project, read through this list below and decide which tips you will implement. Next, gather the tools you need. Some might be cleaning supplies, storage bins, labels, markers, and binder clips. 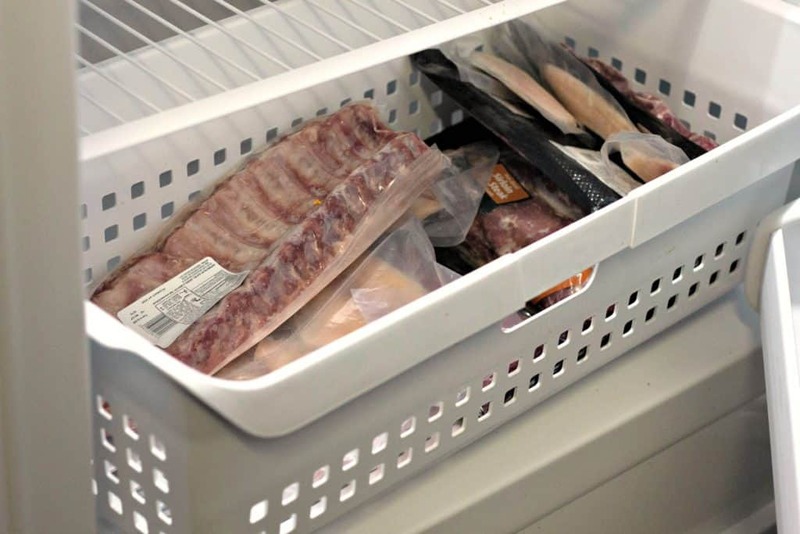 Now… on to the freezer organizing hacks! Add bins of various sizes based on your needs. Fill the bins with foods in the same categories. I love that the bins can be removed for easy cleaning. Add labels to your bins so your family is clear on what items go in which bins. Also add expiration date labels to foods that do not have them. I place items for my daughter to grab from the freezer door because this is easy for her. All other foods are stored on shelves or in bins based on food categories. This helps you eliminate time digging for what you need, because you go right to look in the correct section of your freezer. If you have kids at home, make frozen snack, breakfast, lunch, and dinner bins. This way they can go to the freezer and easily find food to fix for themselves. #MomWin! As I mentioned above, I love to stock up on family favorites to always have on hand. This saves time, energy, money, as well as your sanity on those busy weekdays. A vacuum sealing machine can help you eliminate any wasted space in your freezer. When foods come in big boxes, remove them and place them in easy to store bags instead. Set a recurring reminder on your calendar to clean your freezer every month. Keeping on top of the cleaning will help you keep your freezer organized and avoid spending a lot of time on reorganization projects. Lay bagged foods out flat on a large cookie sheet and freeze the contents until solid. Then remove them from the cookie sheet and stack the bags upright for easy access and optimized storage space in your freezer. 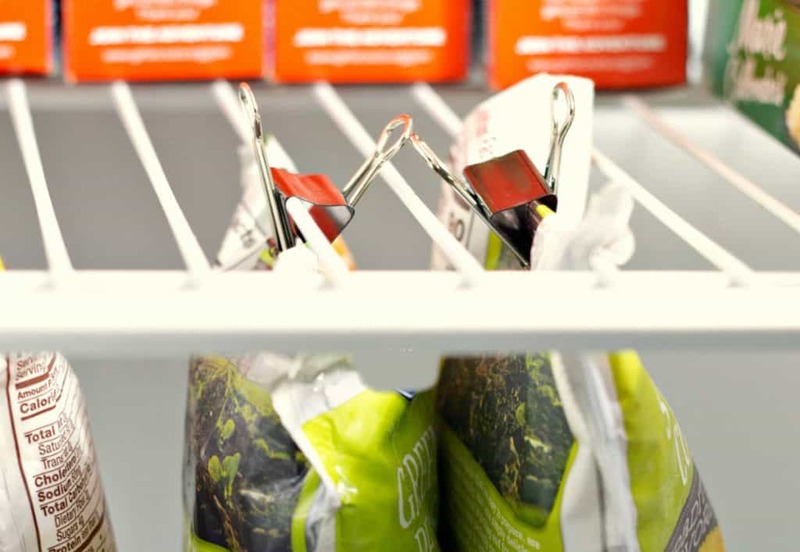 Use large binder clips or chip bag clips to hang bags of veggies from the wire shelving. This utilizes otherwise empty space and still allows you to store items under the hanging bags. 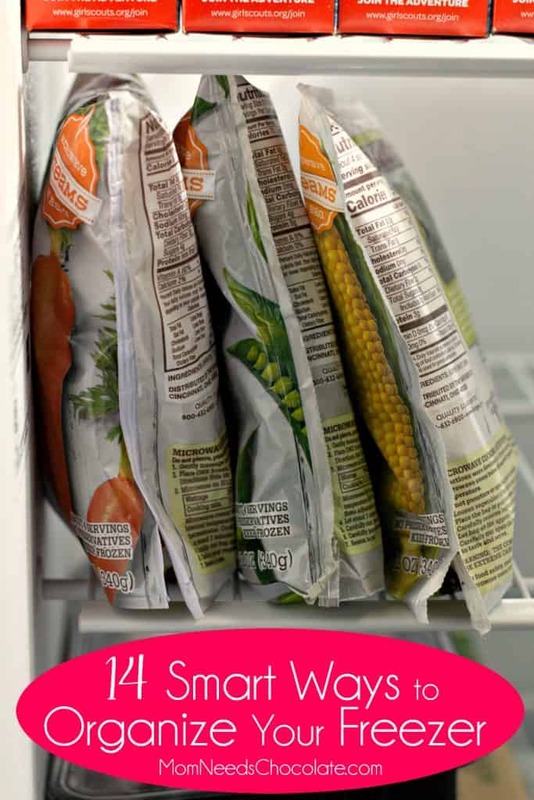 Then the bags of veggies are really easy to reach and half used bags don’t fall over and spill into your freezer. 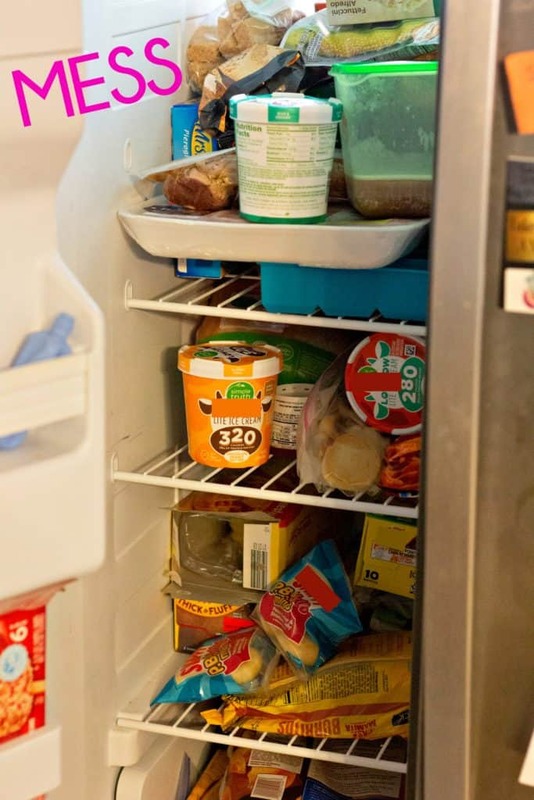 Get creative with your freezer space and move shelves around, or remove some altogether if they’re not needed. Keep an inventory of what you have in the freezer. You can do this with a paper and pen attached to the freezer door. But my personal favorite freezer organization hack is to use a dry erase marker or a super washable marker to write an inventory right on the door! (This only works for non-stainless steel appliances) I have a big white freezer in my garage that I can write on the door of to keep an up-to-date inventory. Love it! Try covering the shelves with a press and then seal type of plastic wrap. This makes for easy clean up in the case of spills. 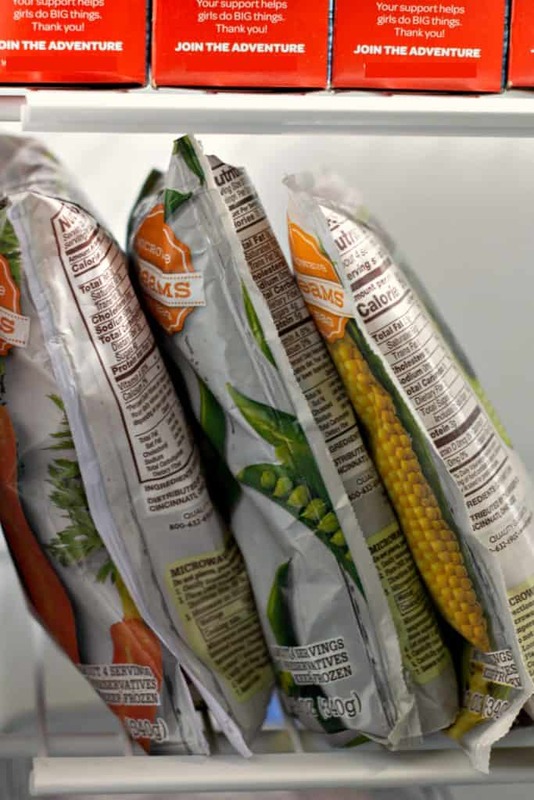 Frozen foods can be stored in square shaped reusable shopping bags instead of bins. They’re great because the handles and easy to carry design means you can remove a whole category of food and reach for another that is toward the back of the freezer. Once you get what you need from the back, just pop the shopping bag of food back into the freezer. Easy! 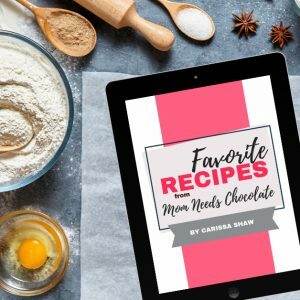 After you clean and organize your freezer, stop back here and tell me how it worked out for you in the comments below, or tag me on Instagram at @momneedschocolate. Can’t wait to see your happy freezers!